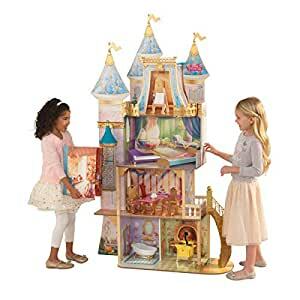 The Disney princess royal celebration dollhouse by KidKraft is a four-level magical castle inspired by your favorite Disney princess stories. It stands over five feet tall, features a 10-piece furniture set and a bonus expansion accessory play book that provides even more play rooms when opened. With an elegant rooftop balcony, sticky notepad-sized easel and a working elevator, this dollhouse is a wonderful gift for children ages three and up. This wooden dollhouse is an enchanting addition to any little princess’s playroom and will be a treasured item for years to come!